I think that it is about two years since I have been backpacking with my mate Rae, who has been out of action due to a foot injury. 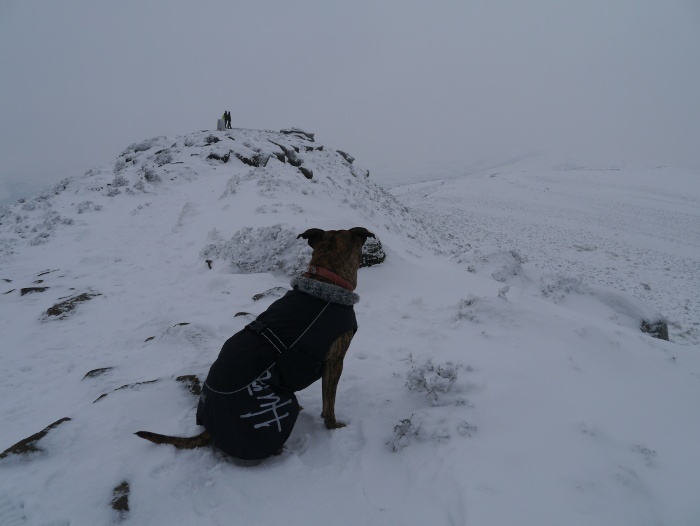 She is keen to get back into the hills with a pack on her back. 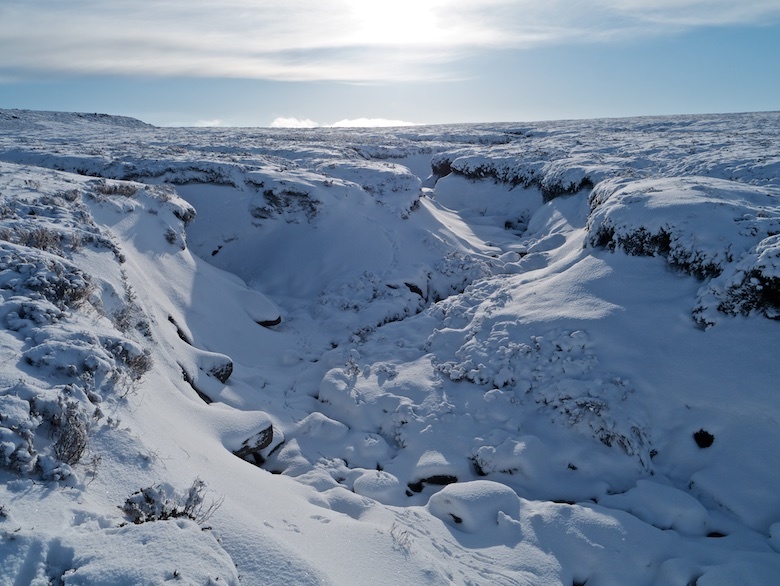 Therefore I planned a short and sweet trip to the North Pennines. One of those trips where it is more about the camping than the walking. My kind of trip as the walking sometimes gets in the way of a good slackpack. 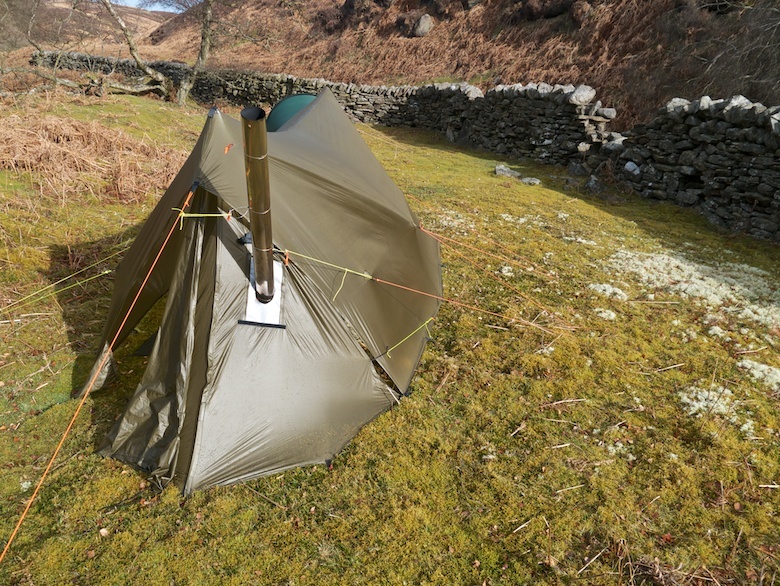 With short walking days planned I thought that it would be a good opportunity to take the Kifaru Megatarp and wood burning stove. Nothing beats relaxing in a heated tent. I escaped work after lunch on the Friday, picked Rae up and headed to the North Pennines, getting stuck in the usual weekend afternoon rush. 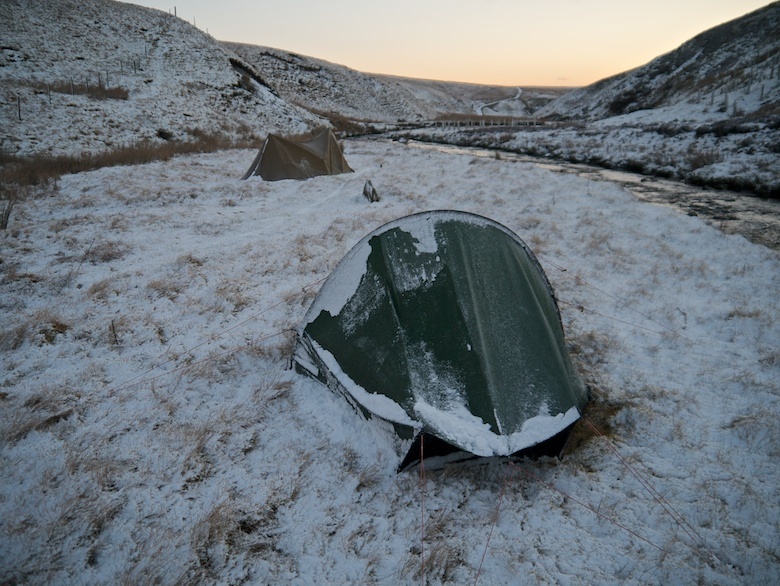 The plan for the first night was to park the car and walk a short distance up a remote valley to pitch for the night. It was getting dark as we arrived at the small car park. What had looked like snow on the other side of the reservoir ended up being a huge flock of gulls. An impressive sight. 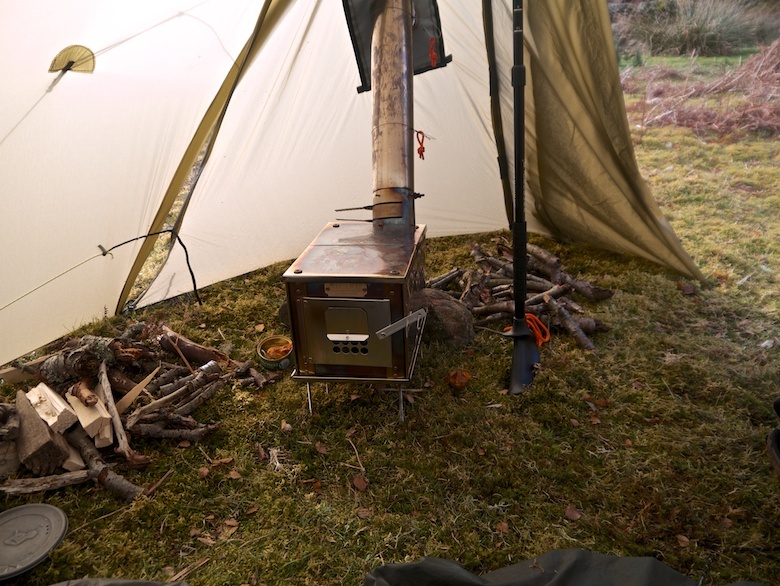 My pack was heavy with around 5kg of wood along with the stove itself. We set off into the gloaming, eventually using our head torches once we left the security of the track. Distances and obstacles can be exaggerated when you can’t see where you are going. We sloshed through marshy ground and contoured along steep banks as we followed the river. Finally we found a flat spot which we felt was far enough not to be discovered the following morning. It was windy as we pitched, stony ground making it especially difficult to get a secure pitch with the large mass of material that makes up the Megatarp. The wind soon brought rain with it so we retired to our respective shelters for the night. 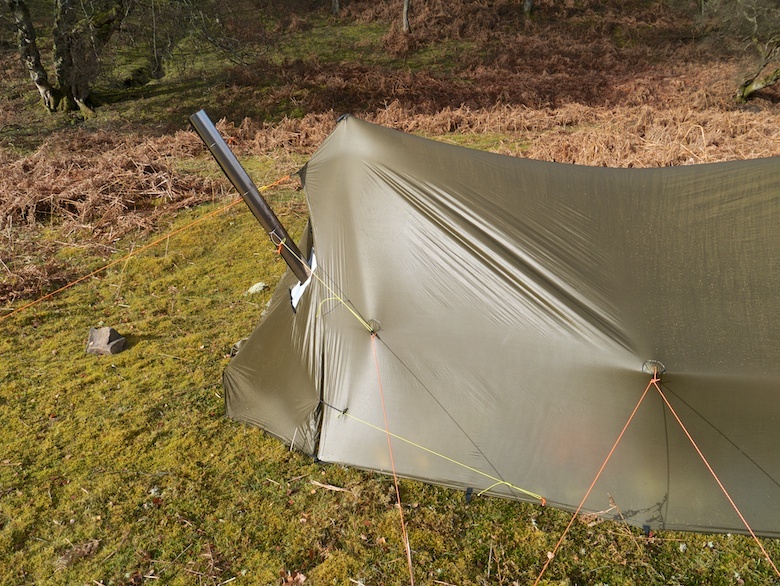 With a badly pitched, flapping tarp with insecure peg placement I erred on the side of caution and decided not to set up the stove. I felt that it was an accident waiting to happen. 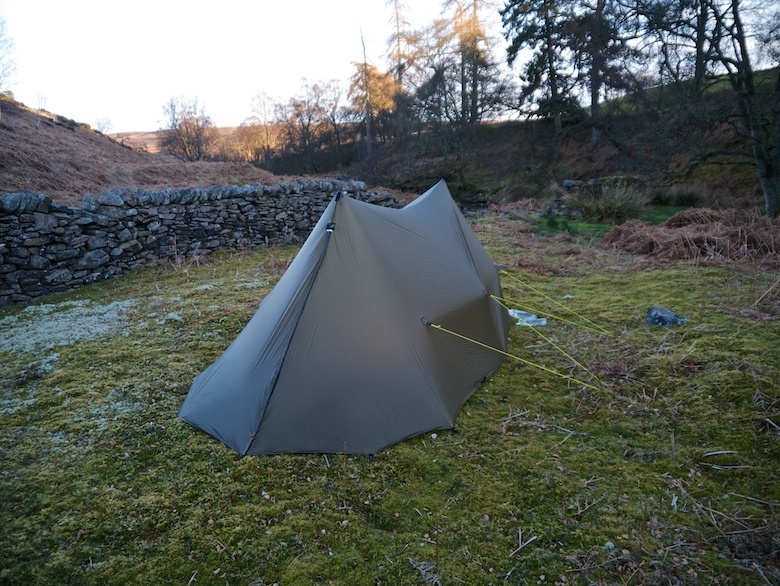 With copious amounts of condensation (even with a large and very well ventilated shelter you still get it in certain conditions) during the wet and windy night I suffered the curse of not having an inner. The wind would shake the walls leading to a very fine spray falling on me every now and then. 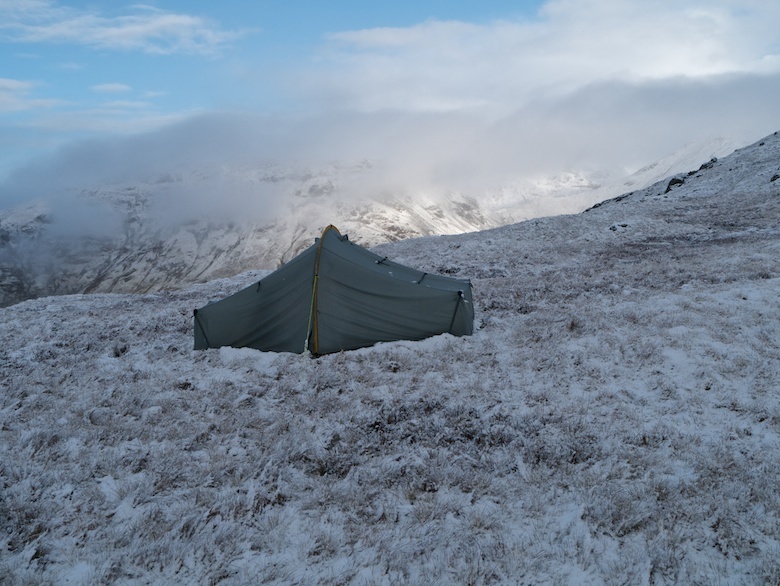 Luckily I had brought a lightweight bivy, meaning my bag stayed dry. I woke at dawn, getting up to answer a call of nature. I was totally surprised at the scene outside. It turned out that what I had thought was rain had in fact been snow. I wandered around for a while taking photos, before the cold sent me back into my sleeping bag for another couple of hours. Bright warm sunshine woke me up and it was nice to lay in my bag for a while, enjoying the feeling of warmth whilst outside there was snow. Rae was awake and cooking when I got up. It looked like it was going to be a beautiful day. Unfortunately the sunshine was quickly replaced by a wall of thick cloud bringing along a stinging blizzard and strong winds. 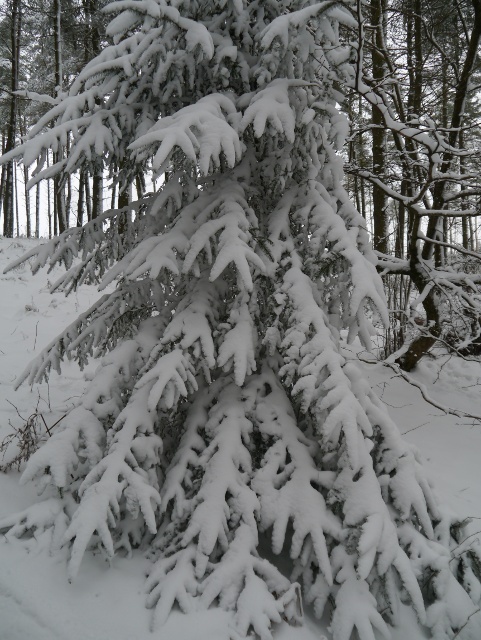 The world became a swirling chaos of white, big flat snow flakes quickly covering ground that had melted in the sun. That set the tone for the rest of the day. 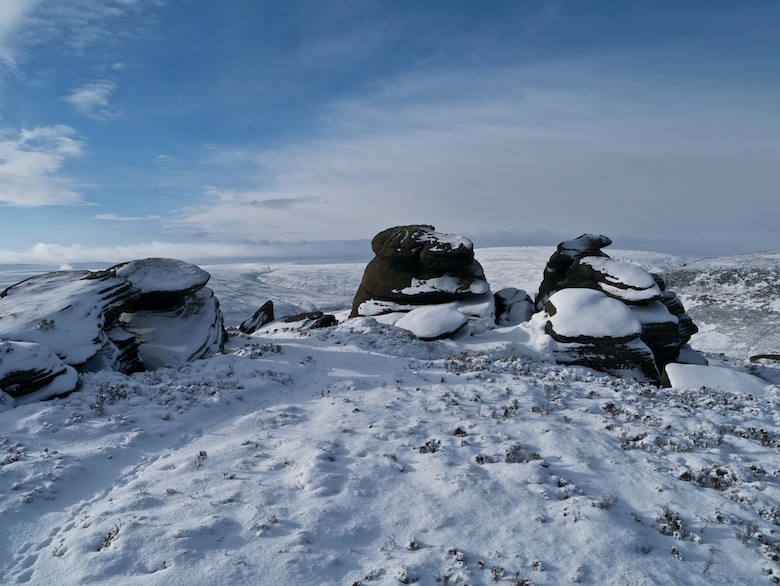 Sunshine and big beefy wintry showers. Packed up and on the way back to the car we were passed by a farmer on a quad bike towing a trailer full of collies. He stopped at a gate and waited until we had passed through it. He asked if it was our car parked and if we had spent the night on the moor. We confirmed that it was and we had. I expected a telling off but instead he told me about a shooting hut nearby that would have provided good shelter. 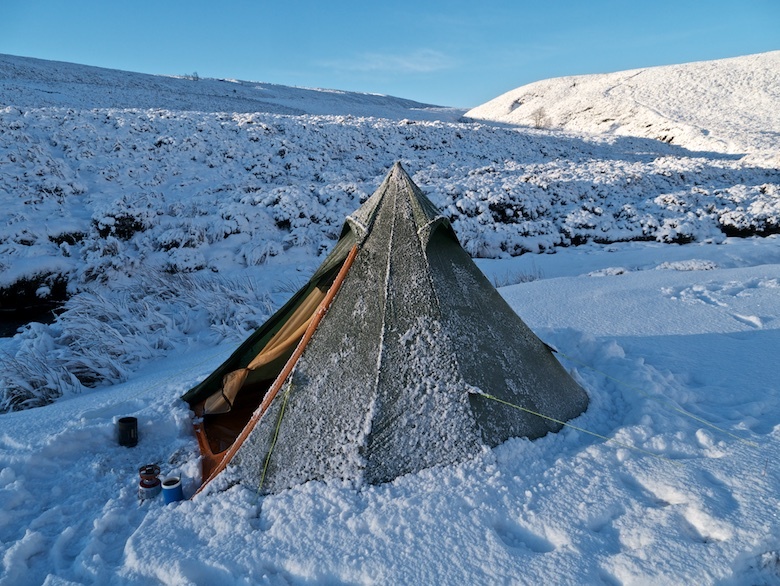 I had a feeling that he thought that it was a bit daft camping out in the snow. Back at the car we sorted out our packs with food for that evening and drove off down the valley, heading into the hills above Teesdale. A high level car park providing a springboard onto the moors without too much climbing. It was a simple walk of less than five miles to our chosen spot. My pack was still heavy with the wood I had failed to burn the night before. Traversing rugged pathless ground Rae spotted an adder curled up sunning itself. It took my eyes a while to pick it out as it was so well camouflaged. 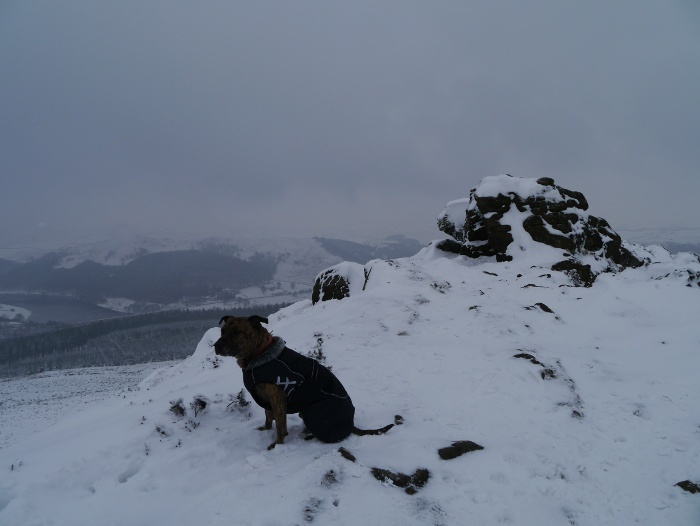 I had not brought Reuben along for the weekend as dogs are banned from much of the CROW land in the North Pennines. I was doubly glad he was not with us as he would have spotted it long before us. 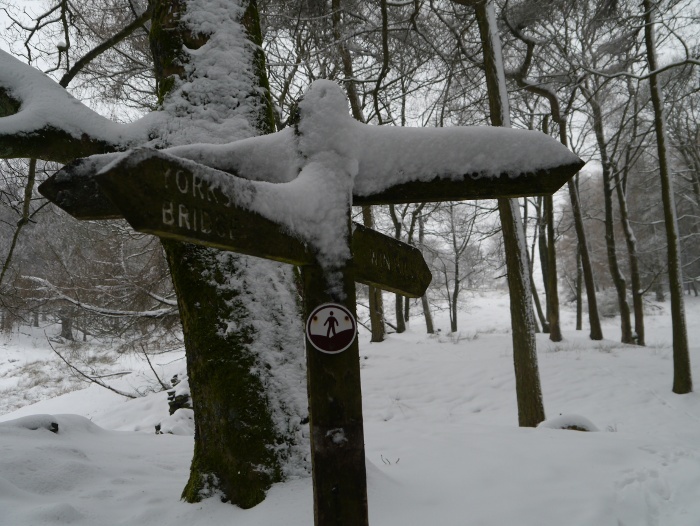 A rough path along the boundary of the moor led to seven very unpleasant surprises. A series of snares had been set up, the first almost tripping me over. 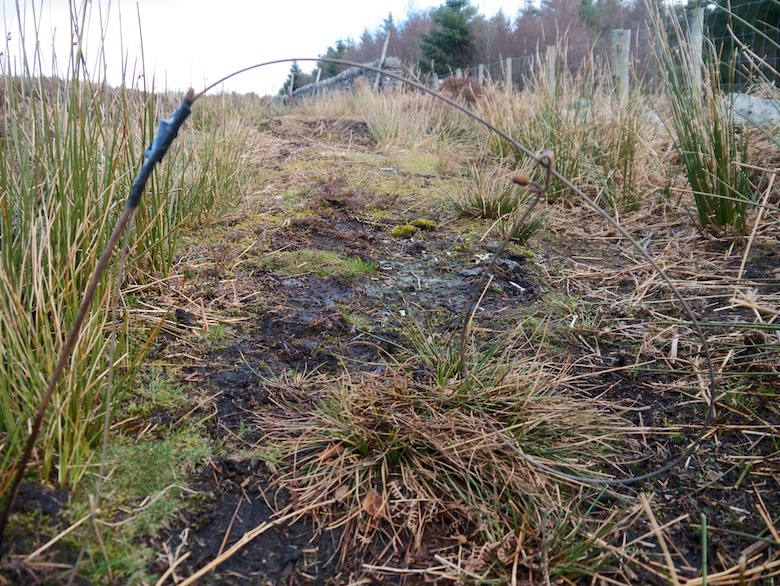 I’m not sure what they are designed for but a small dog could easily get trapped These along with several pole traps over water courses made it very clear that any creature other than grouse were not welcome on this moor. I’m not sure on the legality of the snares as they were free running (I have used the word were). Legal or not the ethics of such things are another matter. Not exactly a humane way of eradicating predators. Just to make a point; the only living and breathing things we saw that day or the next whilst on the moors were grouse. Hundreds of the stupid bloody things. 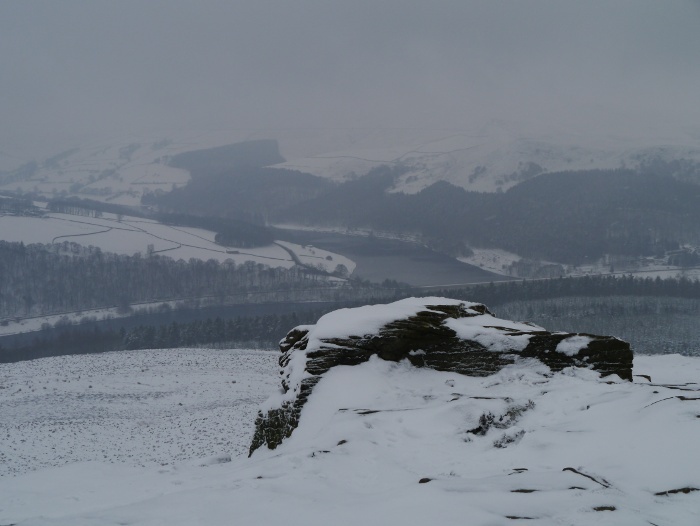 No raptors in the sky and none of the usual sounds of spring on the moors that you get at this time of year. A sterile dead monoculture. 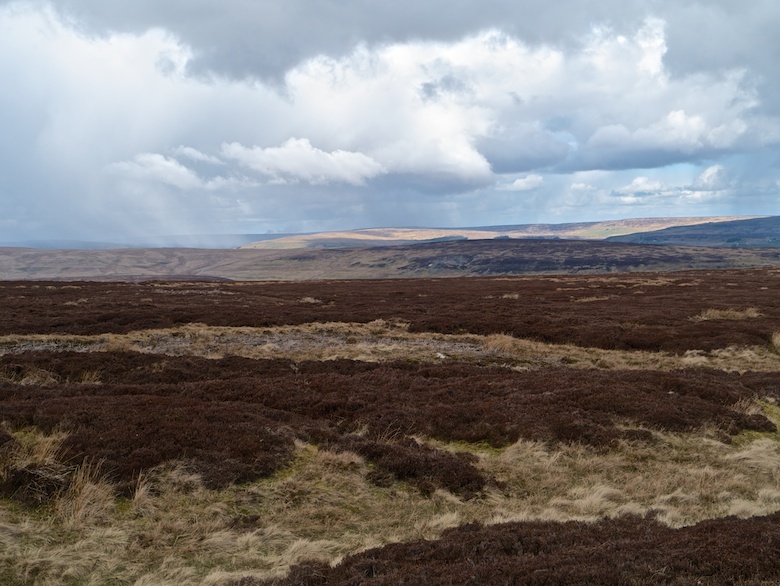 Further along the moor of death the views opened out to the east, the North York Moors visible on the horizon. 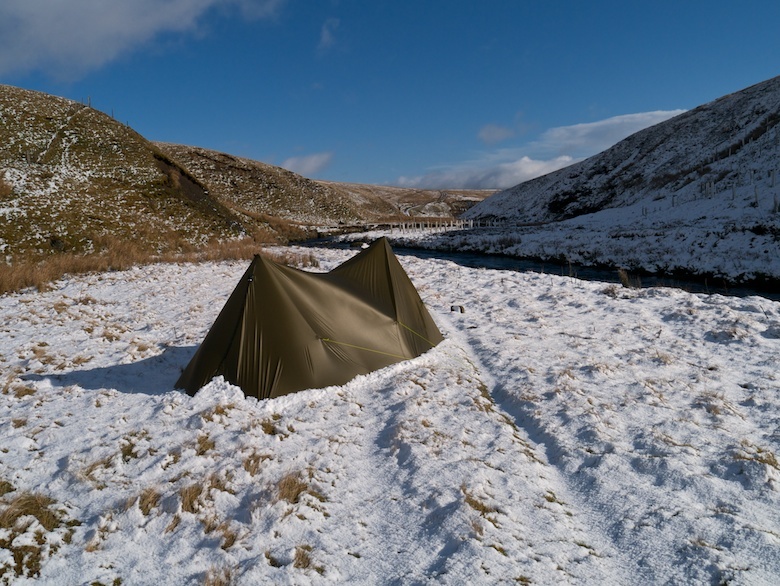 We descended to one of my favourite wild camping spots in the area. 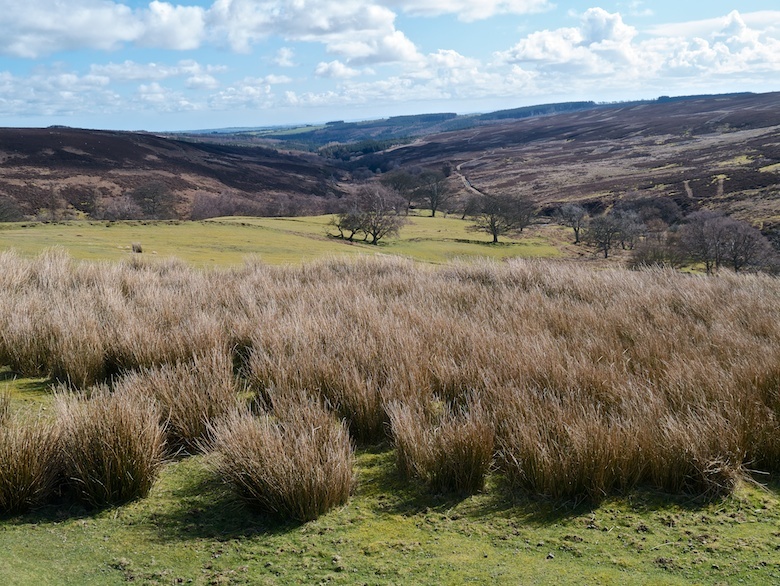 An oasis of green and nature amongst the sterile moors. 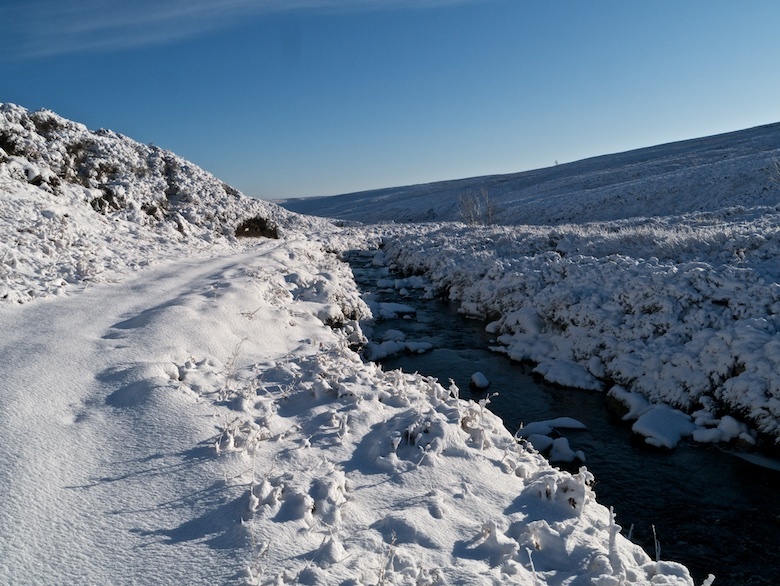 We forged a difficult route to a very secluded spot hidden deep up a valley. With no wind, a burbling brook and birds singing in the trees it was paradise. This time I had time to play around and get a perfect pitch. As darkness fell I set up the wood burning stove and piece by piece set fire to the bag of pre-sawn wood that I had lugged in. The stove heated the tent nicely and we sat in front of it chatting for a while. 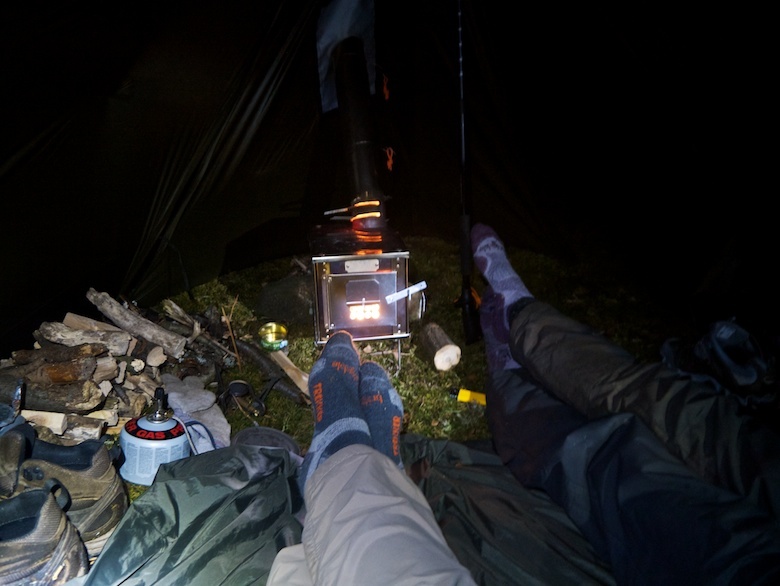 Once the stove had gone out the temperature quickly dropped, a cold night following. Thankfully there was little condensation and I did not wake to a morning shower. We had a relaxed morning, enjoying the location and the sunshine. Secure in the knowledge that it would be unlikely that anyone would pass by. 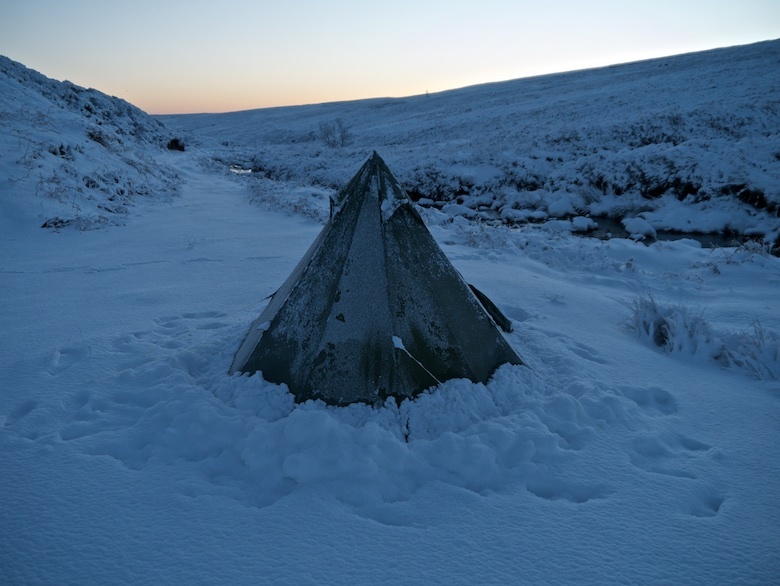 Pitched correctly the Megatarp is a well designed bombproof shelter. 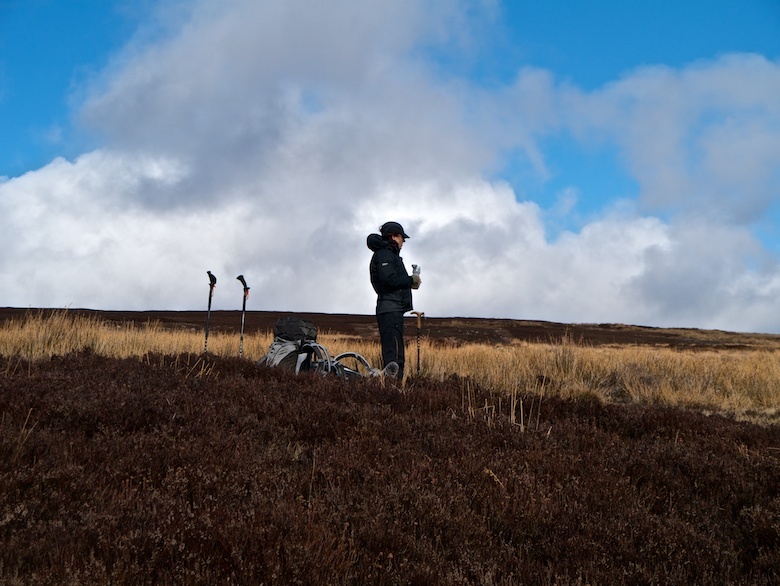 Not one to pitch single-handed on a wet and windy moor though. Our route back to the car led up through pastures full of bird life before we once more entered the sterile monoculture of the moor. 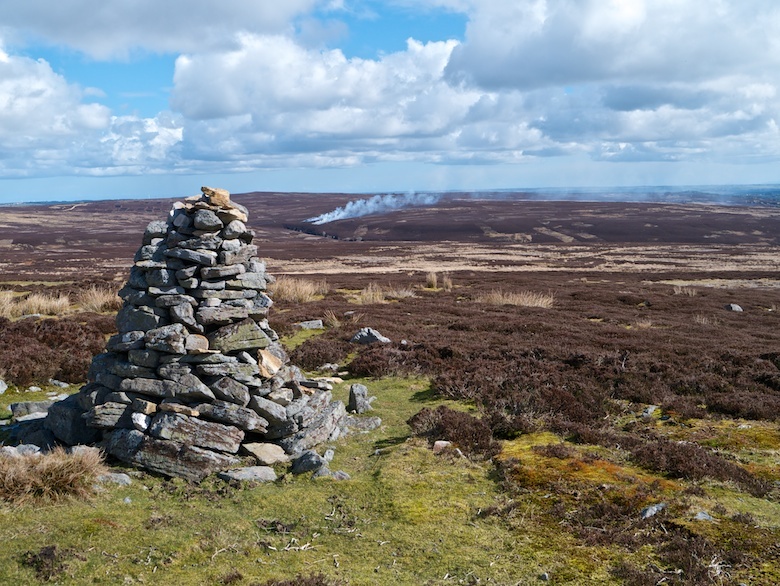 Patches of heather were being burned, smoke rising from all directions as far as the eye could see. 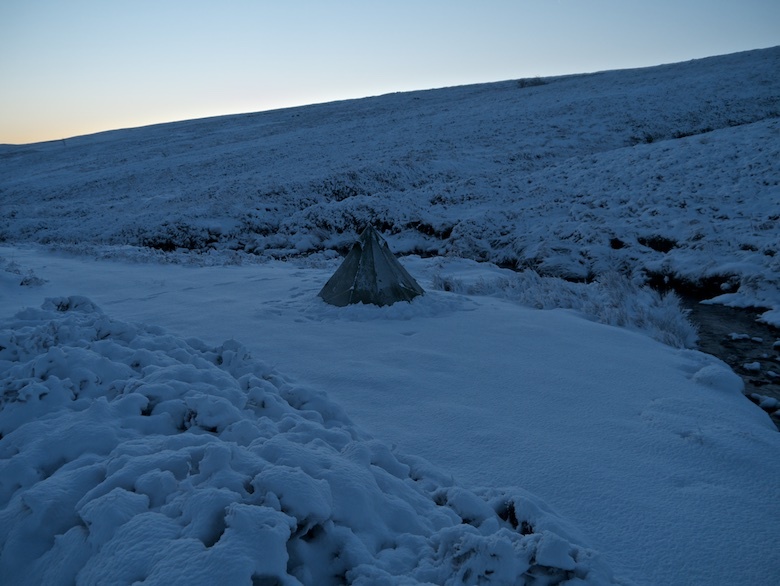 A cairn gave us the chance to relax for a while in the sun, before the first in a series of wintry showers barrelled in. Dramatic skies accompanied us on the final couple of miles back to the car. 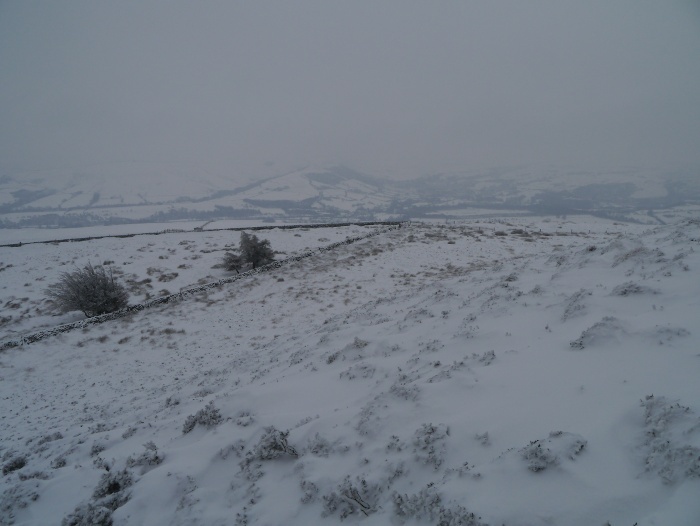 The plan to stick to the main roads paid off and I got to Hathersage without any problems. 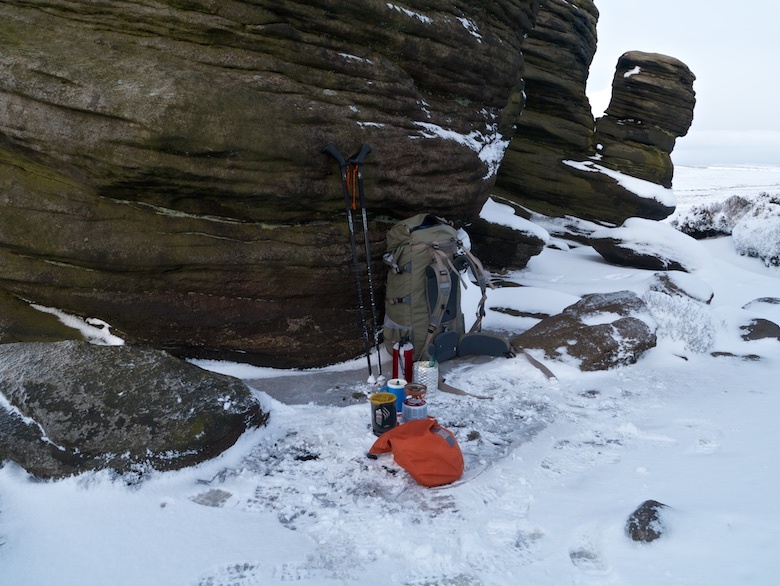 However it got rather tricky when I decided to pay Outside a visit, I needed some new gaiters and fancied a fry-up before heading into the hills. In their wisdom they had left their car park open without attempting to clear any of the snow that had accumulated. The result being that I needed to be pushed into a space after losing all traction. My car is totally hopeless in snow and ice. 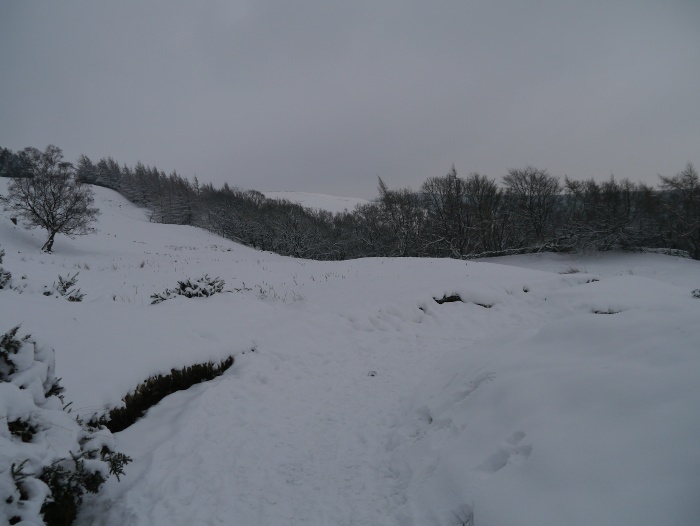 As it turned out the fry up was rather nice and the gaiters out of stock. I left the car at the side of the road near the Yorkshire Bridge Inn, assuming there were no yellow lines buried under the snow. 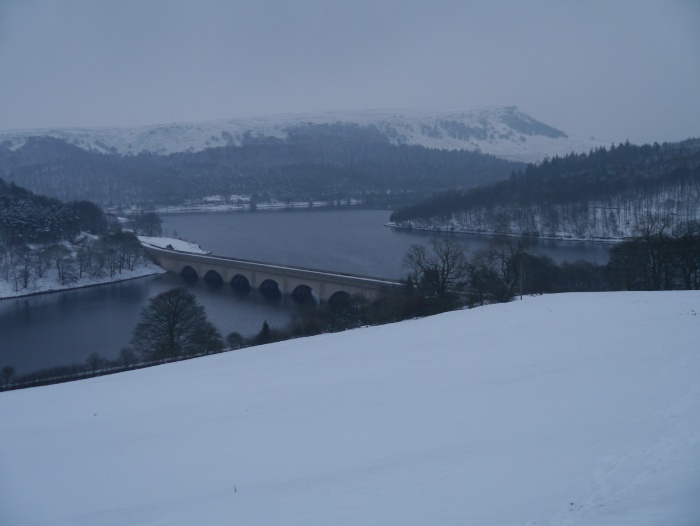 As we crossed the Ladybower dam it was good to hear the snow squeak under my feet. Although there had been snow on the ground for a couple of weeks in Nottingham, it’s just not the same when in a city. Here it was much fluffier and gave that satisfying sound when walked on. 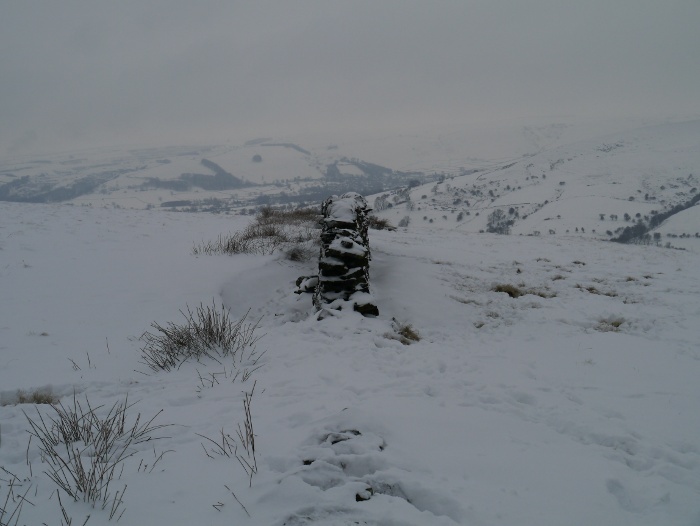 Usually when I climb Win hill I go straight up the lung busting Parkin Clough. 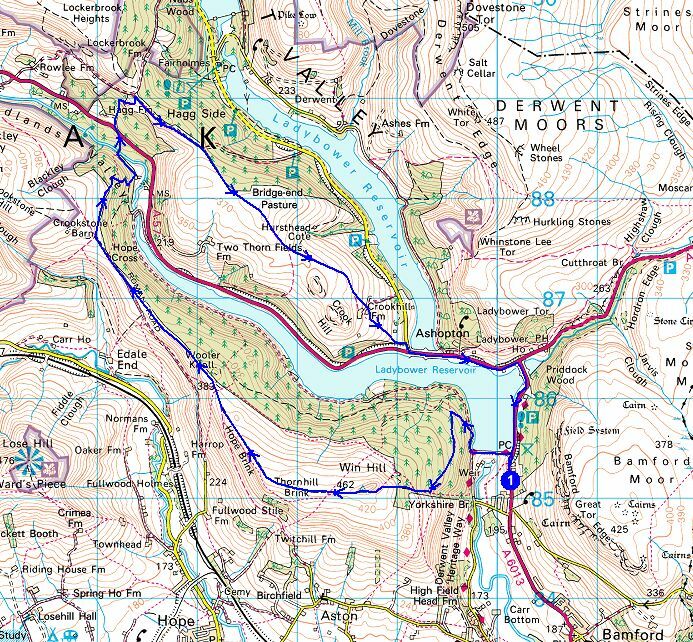 However I fancied a gentler ascent so we followed the shore of the reservoir for a while before taking a nice easy signed footpath. 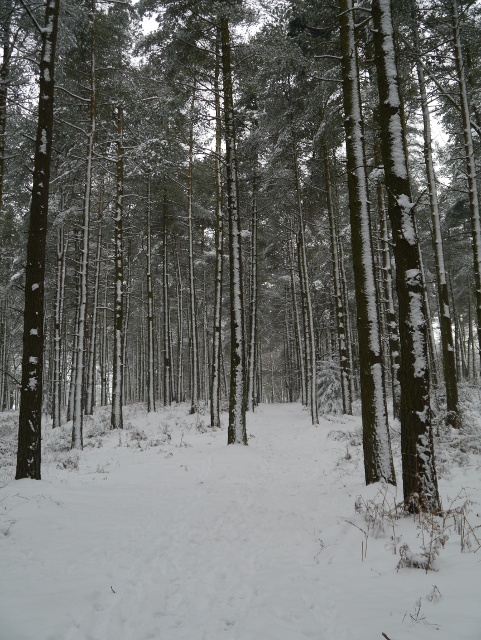 It was truly magical walking through the snow covered woods. 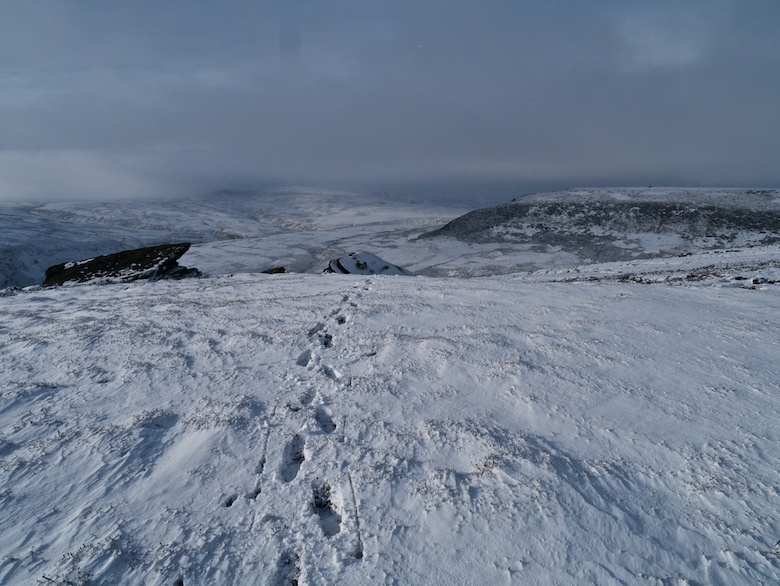 As we approached the edge of the moor it started snowing, curtains of white hiding the surrounding landscape for a while. Out of the shelter of the trees the wind nipped at exposed skin, yet at the same time I was sweating due to the exertion. 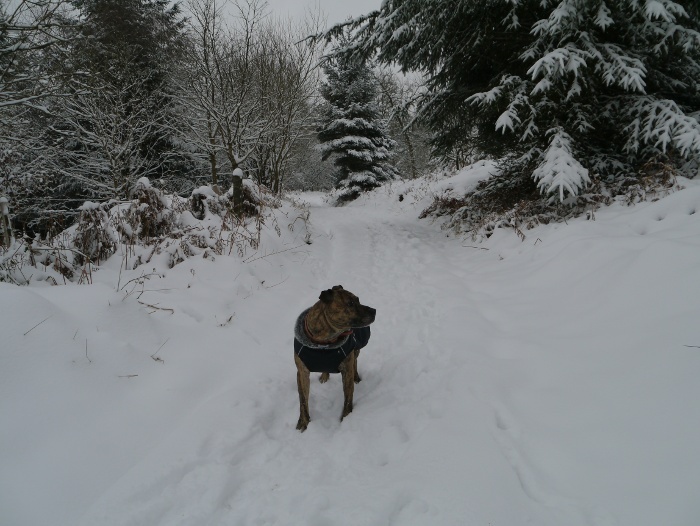 Reuben however was as happy as a dog in snow. He was bouncing around tail wagging, bounding through the deepest drifts. 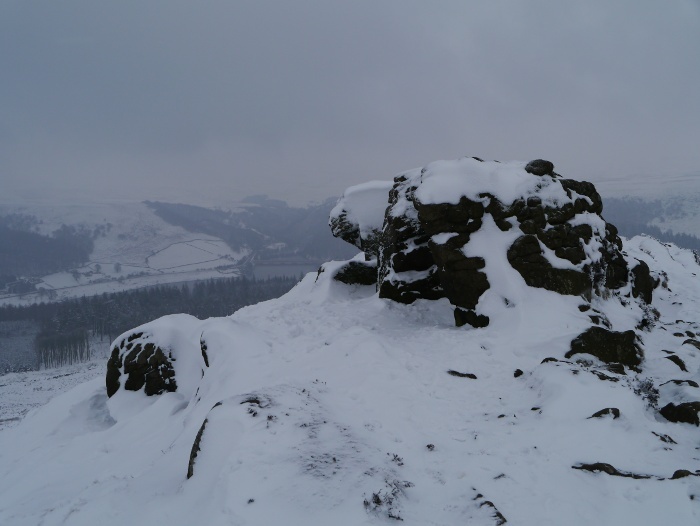 The rocky summit of Win hill was quickly reached and I stood for a while to soak in the view. Much of the surrounding landscape was hidden under a blanket of low cloud. 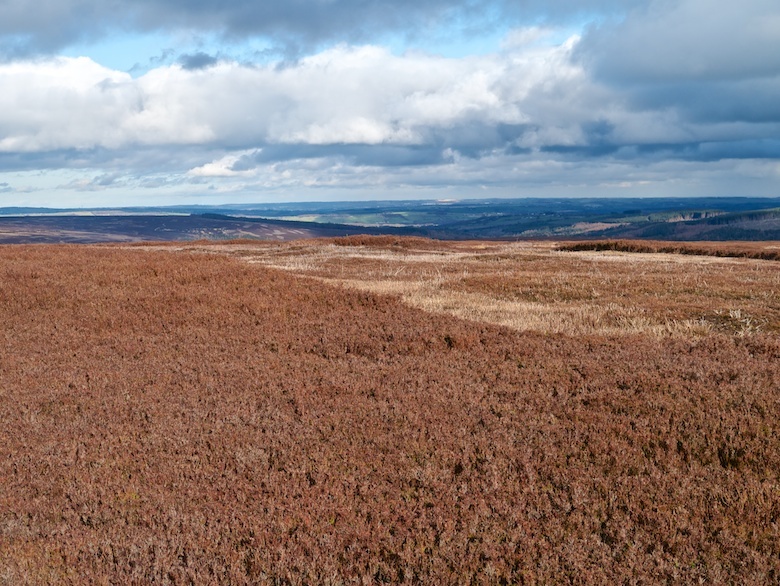 However Win Hill gives a good impression of height out of proportion to its small stature, especially with the reservoirs far below. It was midday and I measured an air temperature of -3C with a wind chill of -10C, cold enough not to want to hang around too long. 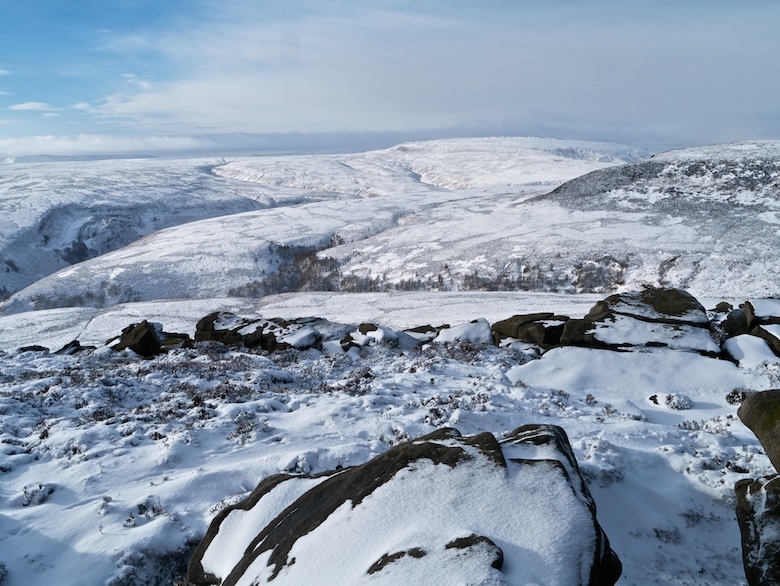 The summit of Win hill is a small rocky cone at the end of a long ridge that leads to the eastern slopes of Kinder Scout. 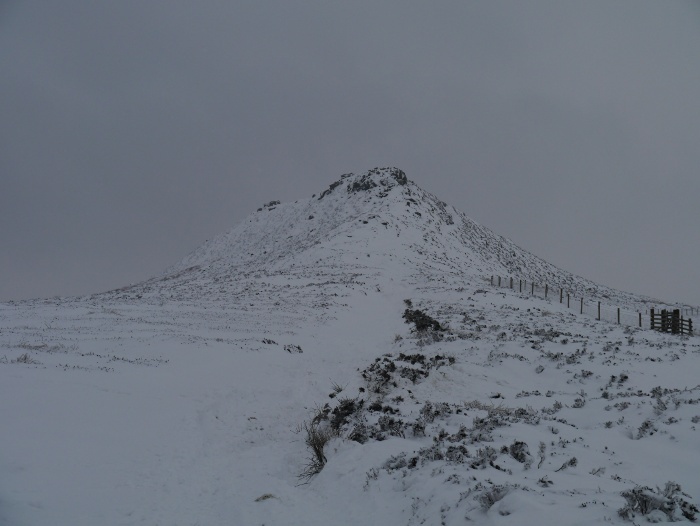 The mixture of snow and rock gave an impression of a much bigger hill after we descended to the north. 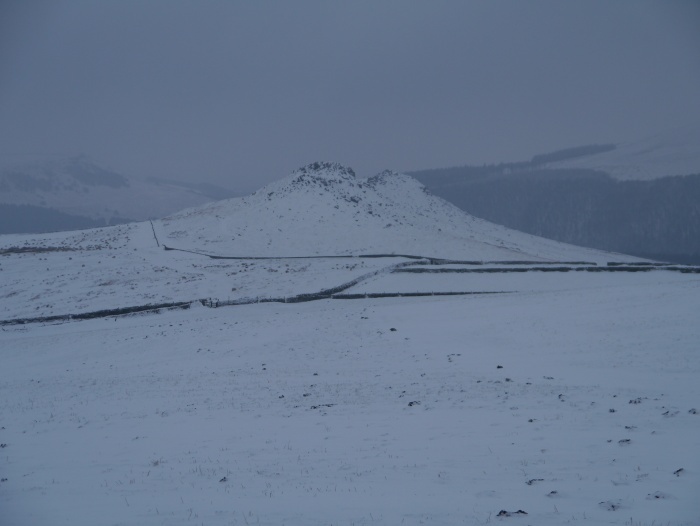 Thankfully the stretch of moorland towards Hope cross was easy going as a vehicle had recently driven and consolidated the snow. With the bales of hay dotted around I reckon it must have been a farmer out to feed the sheep. It was a good hands in pocket sort of yomp whilst Reuben bounded around. 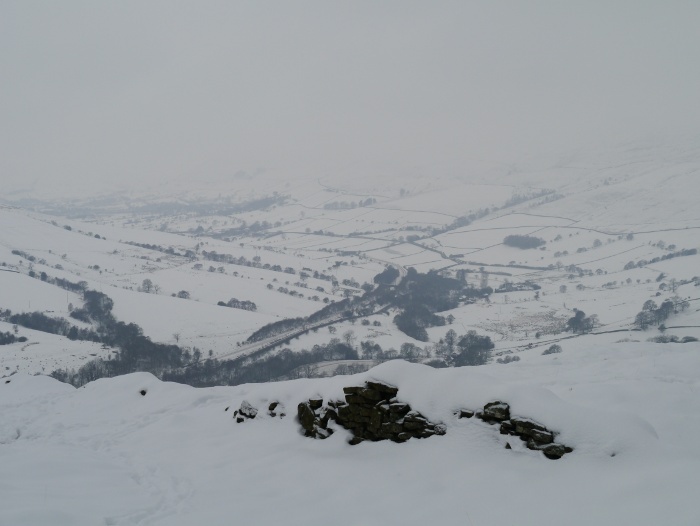 Even though visibility was poor I enjoyed occasional views down into both the Hope and Edale valleys. 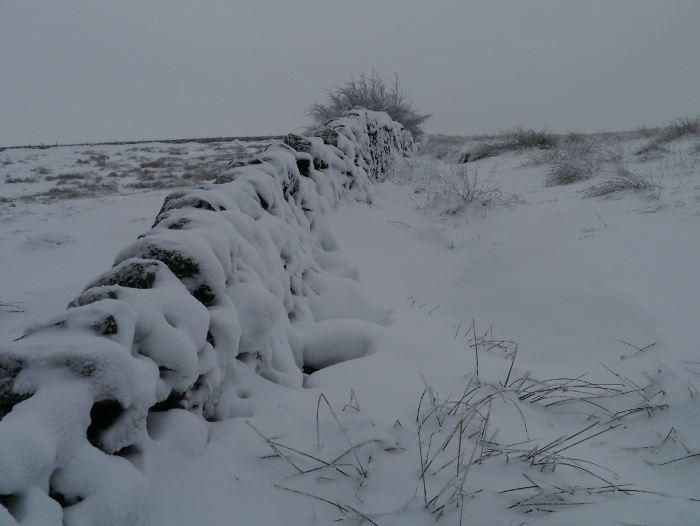 Crab sandwiches and a flask of coffee was enjoyed with a dry stone wall and a belt of trees providing shelter from the wind. The crab sandwiches grabbed Reubens attention and he watched me eat with rapt concentration. 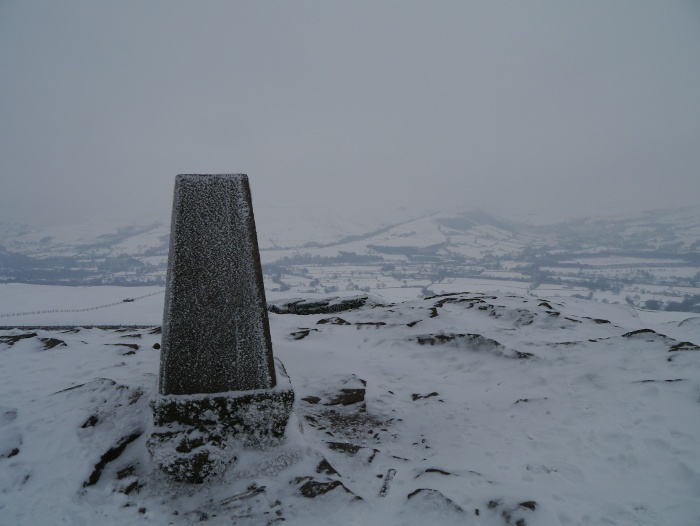 I had thought about ascending Crookstone Knoll as it is a mighty fine view-point. 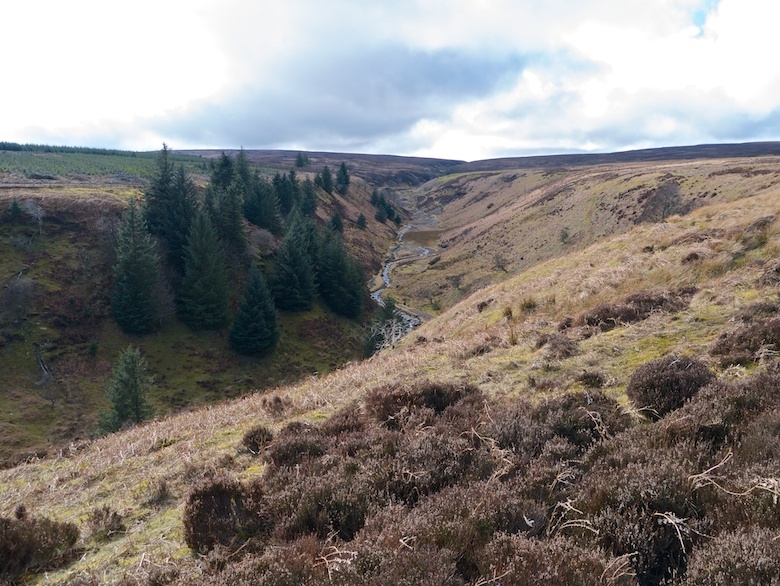 However it was hidden from view so we took the bridleway through the forest to Haggwater bridge and then the Snake pass. Crossing the busy road another bridleway took us steeply onto the ridge above via Hagg farm. 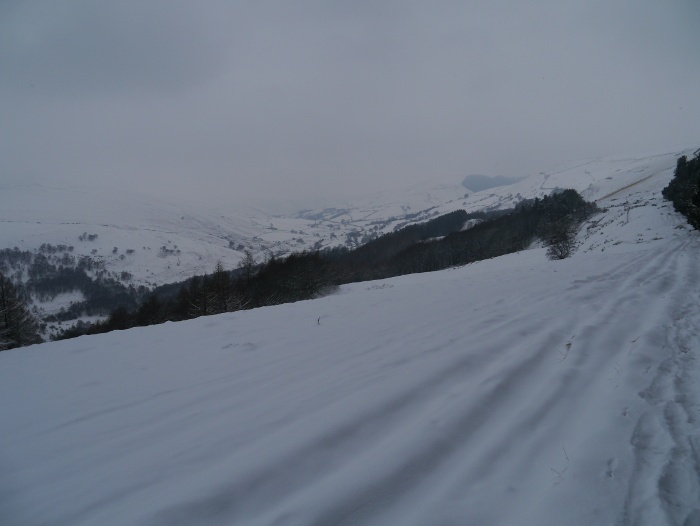 I have to admit that I was starting to tire, walking though snow being more difficult than I remembered. 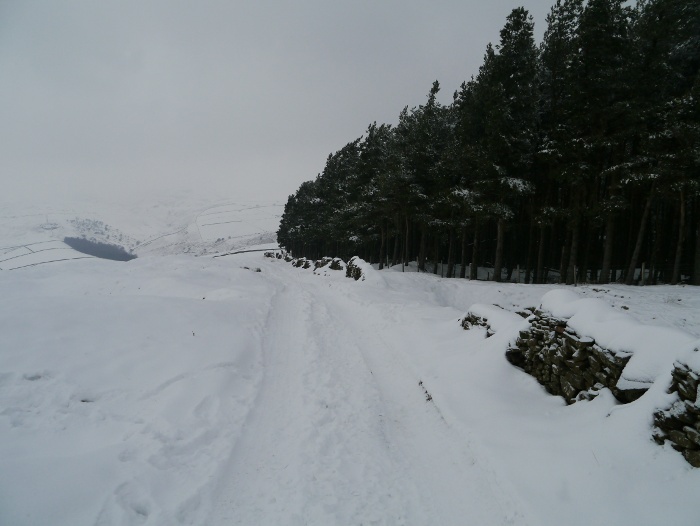 The next section along the bridleway at the edge of the forest was particularly tough with no footprints to follow. It was hard to tell if the snow was an inch deep or up to my knee. Occasionally there would be a hidden boggy patch to add to the unpredictability of it all. The fields of Bridge-end pasture felt like tundra as I slowly plodded onwards, jealous of Reuben’s four pawed drive. He had no intention of slowing down. 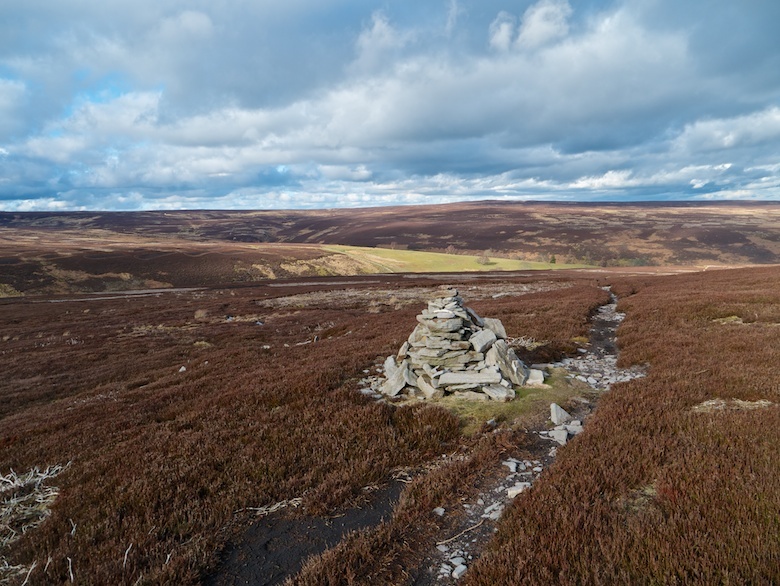 The twin topped summit of Crook hill came into view, almost a mirror image of Win hill across the valley. It gives a superb viewpoint and is very neglected in comparison to its much more famous twin. However as I got to its base I had lost the enthusiasm for the short climb to the top. 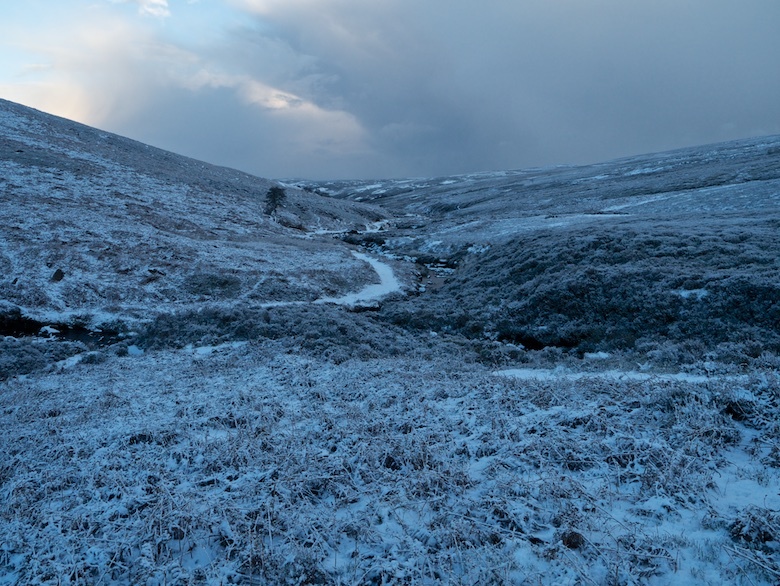 It was beginning to get dark and I was keen to get off the hill before being fully enveloped by the gloaming. A huge flock of sheep were gathered around piles of hay and they all turned round to watch Reuben and myself pass. As a group they all crept a bit closer before turning tail and running away. This was repeated a couple of times. 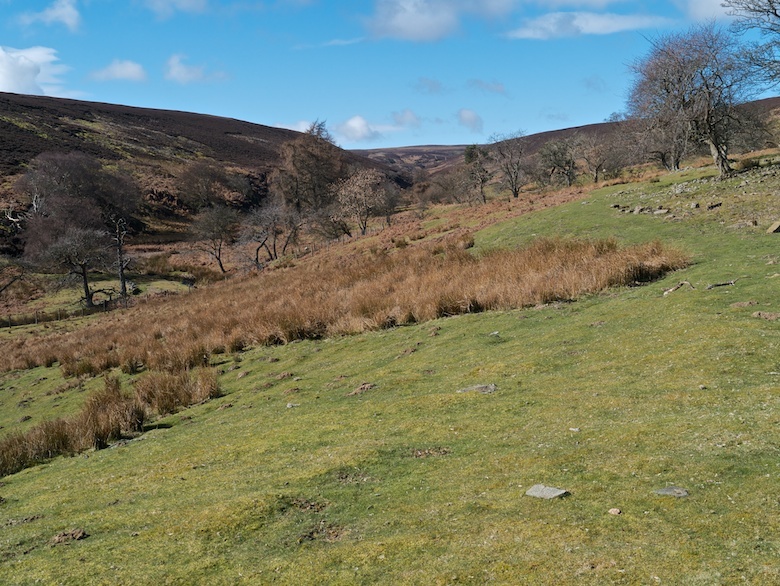 We passed Crookhill farm (which incidentally occupies a cracking location) to walk through fields down to the viaduct over the Ladybower reservoir. The road walk back to the car was a right old slog on deep slush filled pavements. Probably good exercise but as much fun as wading through treacle. 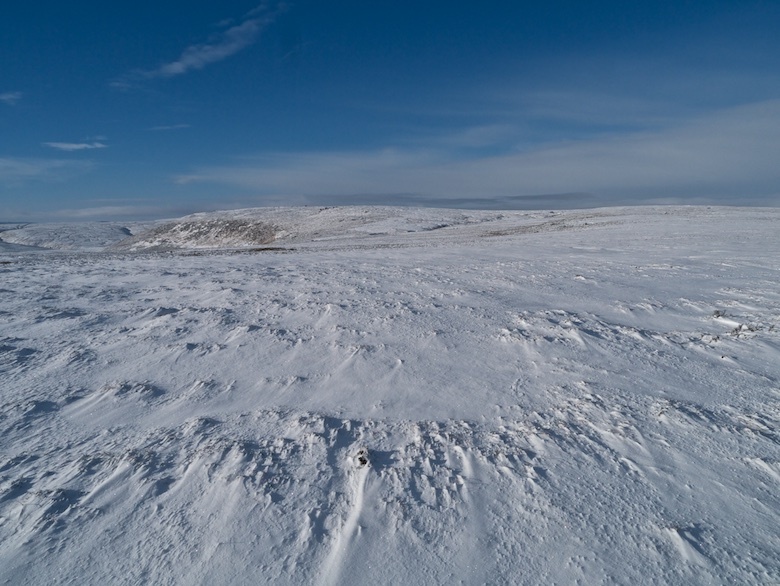 During my trip to the Yorkshire Dales this weekend there was a twenty-four hour period when the weather was perfect. 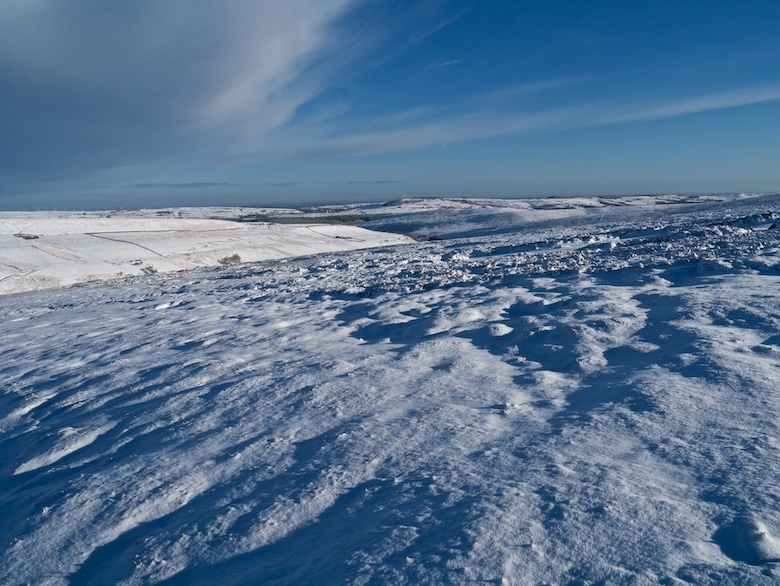 A combination of clear skies, snow, a bright moon and sub-zero temperatures meant that I spent a perfect winter’s night on the moor. For the first time I have attempted to capture one of my backpacking trips on video and talk into the camera. The sound quality is not always brilliant with the wind sometimes obscuring what I am saying, no worries as I spent most of the time talking nonsense anyway! The usual trip report with words and photies will be along in the next few days.